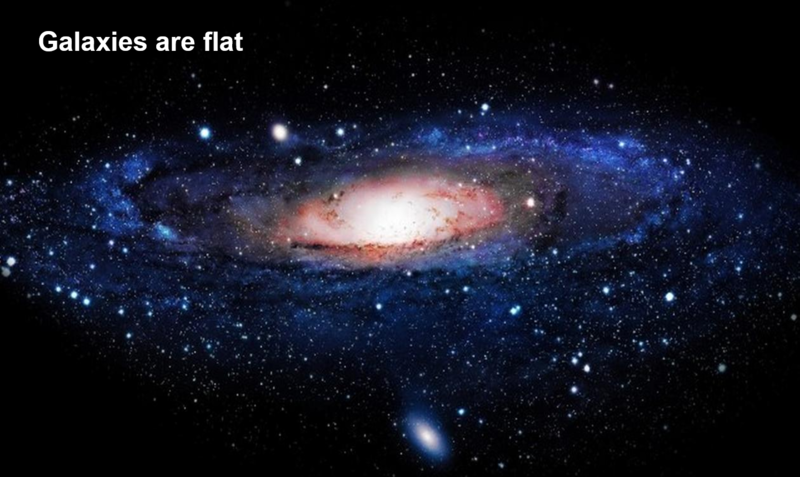 The earth’s orbital plane is not quite flat. The ecliptic is currently reducing by about 1.4 degrees over 100,000 years. Looks like the earlier speculation was correct. NASA is hyping an announcement to be made tomorrow about Mars. A brief question-and-answer session will take place during the event with reporters on site and by phone. It will probably be connected with this paper to be presented this week at the European Planetary Science Congress. Three of the authors are to be at the Press Announcement. Even if not specifically about this paper the announcement is likely to be about water on Mars. Abstract: Recurring Slope Lineae (RSL) are seasonal flows on warm Martian slopes initially proposed, but not confirmed, to be caused by briny water seeps. Here we report spectral evidence for hydrated salts on RSL slopes from four different RSL locations from the Compact Reconnaissance Imaging Spectrometer for Mars on board Mars Reconnaissance Orbiter. These results confirm the hypothesis that RSL are due to present-day activity of briny water. It would suggest that the dark streaks observed periodically on the surface of Mars are caused by the seasonal flow of salt-laden water across the surface. The salt levels would have to be high enough to allow the water to remain liquid long enough to create the streaks before it freezes. Some of the streaks seem to be of the order of several hundred metres in length. If there actually is sub-surface ice on Mars, then it is not an unthinkable geo-engineering step (terraforming) to achieving a Martian atmosphere which, in time, could contain free oxygen in addition to water vapour and carbon dioxide. It is still not clear how Earth got its Nitrogen which provides a stable ballast and it is unclear if a similar “ballast gas” could be engineered around Mars. Pure water would rapidly evaporate and/or freeze on the present-day surface of Mars at most times and places; however brines are far less volatile compared to pure water due to their lower freezing points and evaporation rates. Various salts (e.g. sulfates, chlorides and perchlorates) have been detected on the surface of Mars from remote and in situ investigations. These salts can lower the freezing point of water by up to 80 K, lower the evaporation rate of water by an order of magnitude, and can be hygroscopic (i.e. able to easily absorb atmospheric moisture), thus increasing the possibility of forming and stabilizing liquid water on the surface of present day Mars. Recurring Slope Lineae (RSL) are narrow, low reflectance features forming on present-day Mars that have been hypothesized to be due to the transient flow of liquid water. …. The origin of water forming the RSL is not understood, given the extreme aridity of Mars’ surface environment. Water could form by the surface/sub-surface melting of ice, but the presence of near-surface equatorial ice is highly unlikely. Water could also form via deliquescence by hygroscopic salts, although it is unclear how the Martian atmosphere can sufficiently supply water vapor every year to create RSL. The absence of concentrated deliquescent salts would rule out this hypothesis. Another hypothesis is seasonal discharge of a local aquifer, which concentrates salt deposits as the brine evaporates, but then lineae emulating from the tops of local peaks are difficult to explain. It is conceivable that RSL are forming in different parts of Mars via different formation mechanisms. The new compositional insights reported here from widely separated sites provide essential new clues. Water on Mars not only gives a higher probability of some life-form having existed, or existing, on Mars but also increases the probability of human life coming to exist on Mars. That would be something to be around for, but it will be after I am long gone. Roger Pielke Jr. has an interesting article in the Guardian where he addresses the search for extra-terrestrial life. His primary point is that we do not give sufficient consideration to the consequences of success. We see the search as satisfying curiosity but have no real hopes for success. And we have not really given much thought to the consequences of actually finding extra-terrestrial life. Politicians tend to stay away from talking about aliens (unless they are “illegal aliens”) for obvious reasons. The United Nations briefly took up the issue of extraterrestrial life in 1977, but has let the issue lapse since then. In fact, it seems unlikely that any policy makers in national or international settings have a clearly thought–through plan for responding to the discovery of extraterrestrial life, whether that be microbes on another body in our solar system or beady-eyed aliens looking to invade. The conversation is only silly if we assume that efforts to detect alien life will never succeed. But that got me to wondering what would happen not only if we found life but if we found sentient life out there. And I am led to the inescapable conclusion that in the same habitat or space, it is not possible for more than one sentient species to hold sway. If any of the primate species on Earth displayed sentience, we would wipe them out. Not because humans are so evil as a species but because any sentient species dominating a habitat could not tolerate another less sentient species from challenging that dominance. Unless different sentient species, in the same habitat, displayed exactly the same level of intelligence and mastery over the physical world, then the dominant species would have little option but to ensure that its dominance was not, and could not, be threatened. In most scenarios that would mean wiping out the subordinate sentient species. Live and let live would only be feasible if the two species inhabited completely different habitats. To survive, a sentient species needs to be far below the level of sentience of another more dominant species so as to be “allowed to survive”. As a pet species. Or else it must be the dominant species where all other species sufficiently far below in level of sentience may be allowed to survive. If any earth species, gorillas or chimps for example, showed signs of becoming sentient and becoming a self-aware, socially coherent group, they would be a more serious existential threat to the human species than any asteroid impact or super-volcanic eruption. Perhaps we might cede the ocean habitat to sentient dolphins, but even that is unlikely. Sentient birds with dexterous appendages with land and the air as their habitat would not long suffer the human race to survive. The Planet of the Apes type of scenario where genetic modifications by humans inadvertently creates a rival, sentient species is, I suppose, not totally implausible. But as soon as two species in a common habitat are close in intelligence and physical capability, the die is cast and there is space only for one to survive. If our pet dogs started challenging our authority and – say – demanding to set the menu for their meals, they are doomed. If we created neo-chimps which started demanding their “rights”, they could not survive. If cows or horses demanded the right to choose their own partners, they would be doomed to extinction or genetic modification to make them more docile. This also applies to the search for extra-terrestrial intelligence. Suppose we found another sentient species on another planet. It is highly unlikely that it would display a similar level of sentience. Suppose anyway that the species can discern each other and perhaps even communicate. That itself is pretty far-fetched, but not impossible. It is more likely that the “finding” species is higher up in the sentience scale than the “found” species. So if we found a sentient species of inferior ability we might be magnanimous enough to allow it to continue in its own habitat, especially if the habitat was hostile to us. But we would see to it that its habitat was contained and could not expand to ever be a threat to humans. The obvious analogy is with the wiping out or subjugation of the local populations in the Americas or Australia. And that was with populations of the same species. If we find a species that is superior to us (though it is more likely that they would find us), then it would be best if they were so far superior that the human race was perceived to be a “pet species”. Otherwise we are in for Star Wars and may the best species win. And the worst case scenario is that they find us. That we are found on Earth by a superior – but not too superior – species who find our habitat to be of interest. And the worst of worst cases would be if they found that we did not have the temperament to function as their pets and, moreover, if they found that human flesh, lightly spiced, was a particular delicacy. NASA: Dwarf planet Ceres continues to puzzle scientists as NASA’s Dawn spacecraft gets closer to being captured into orbit around the object. The latest images from Dawn, taken nearly 29,000 miles (46,000 kilometers) from Ceres, reveal that a bright spot that stands out in previous images lies close to yet another bright area. Dawn is showing us exotic scenery on a world that dates back to the dawn of the solar system, more than 4.5 billion years ago. Craters large and small remind us that Ceres lives in the rough and tumble environment of the main asteroid belt between Mars and Jupiter, and collectively they will help scientists develop a deeper understanding of the history and nature not only of Ceres itself but also of the solar system. …..
….. 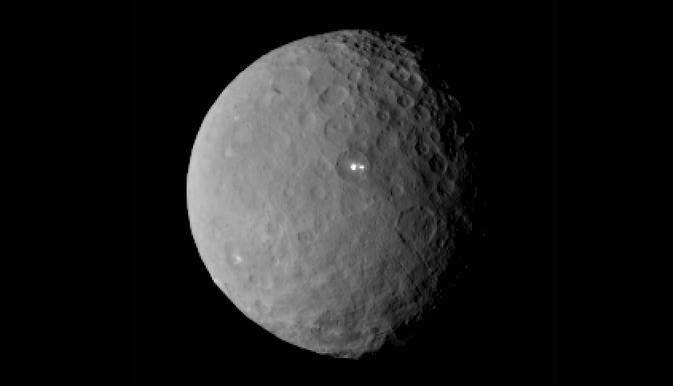 Dawn is in the vicinity of Ceres and is not leaving. The adventurer has traveled more than 900 million miles (1.5 billion kilometers) since departing from Vesta in 2012, devoting most of the time to using its advanced ion propulsion system to reshape its orbit around the sun to match Ceres’ orbit. Now that their paths are so similar, the spacecraft is receding from the massive behemoth at the leisurely pace of about 35 mph (55 kilometers per hour), even as they race around the sun together at 38,700 mph (62,300 kilometers per hour). The probe is expertly flying an intricate course that would be the envy of any hotshot spaceship pilot. To reach its first observational orbit — a circular path from pole to pole and back at an altitude of 8,400 miles (13,500 kilometers) — Dawn is now taking advantage not only of ion propulsion but also the gravity of Ceres. On Feb. 23, the spacecraft was at its closest to Ceres yet, only 24,000 miles (less than 39,000 kilometers), or one-tenth of the separation between Earth and the moon. Momentum will carry it farther away for a while, so as it performs the complex cosmic choreography, Dawn will not come this close to its permanent partner again for six weeks. Well before then, it will be taken firmly and forever into Ceres’ gentle gravitational hold. Ceres (minor-planet designation 1 Ceres) is the largest object in the asteroid belt, which lies between the orbits of Mars and Jupiter. It is composed of rock and ice, is 950 km (590 mi) in diameter, and contains approximately one third of the mass of the asteroid belt. It is the only dwarf planet in the inner Solar System and the only object in the asteroid belt known to be unambiguously rounded by its own gravity. It was the first asteroid to be discovered, on 1 January 1801 by Giuseppe Piazzi in Palermo, though at first it was considered to be a planet. From Earth, the apparent magnitude of Ceres ranges from 6.7 to 9.3, and hence even at its brightest it is too dim to be seen with the naked eye except under extremely dark skies. Abstract: ……. 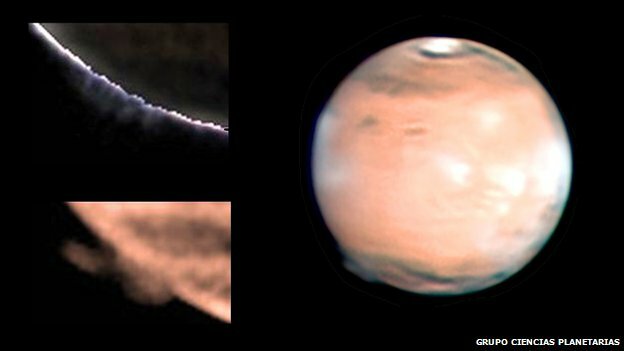 Here we report the occurrence in March and April 2012 of two bright, extremely high-altitude plumes at the Martian terminator (the day–night boundary) at 200 to 250 kilometres or more above the surface, and thus well into the ionosphere and the exosphere. …….. They were spotted at a longitude of about 195° west, a latitude of about −45° (at Terra Cimmeria), extended about 500 to 1,000 kilometres in both the north–south and east–west directions, and lasted for about 10 days. The features exhibited day-to-day variability, and were seen at the morning terminator but not at the evening limb, which indicates rapid evolution in less than 10 hours and a cyclic behaviour. We used photometric measurements to explore two possible scenarios and investigate their nature. For particles reflecting solar radiation, clouds of CO2-ice or H2O-ice particles with an effective radius of 0.1 micrometres are favoured over dust. Alternatively, the plume could arise from auroral emission, of a brightness more than 1,000 times that of the Earth’s aurora, over a region with a strong magnetic anomaly where aurorae have previously been detected. Importantly, both explanations defy our current understanding of Mars’ upper atmosphere. Of course what it really was, was the Martian fleet on manoeuvres. 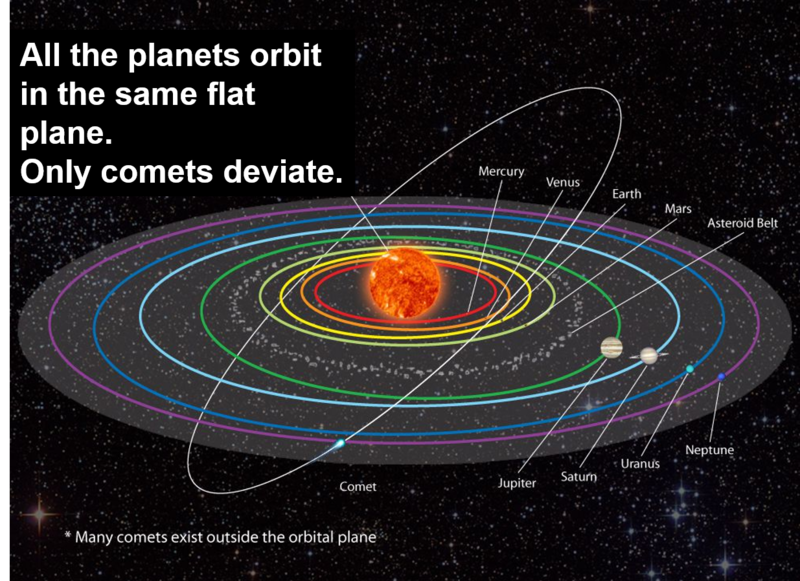 The fleet consists of millions of minute – by Earth standards – spacecraft. Each carries a strand of aggressive RNA specially tailored to modify the DNA of earth based species. They are due to invade Earth probably in February 2018. This will be the Third Martian Invasion of Earth. The First Invasion introduced life to Earth. The Second got rid of the dinosaurs who were not performing or evolving to expectations. This Third Invasion is to correct the cumulative errors – as perceived by the Martians – building up in human DNA. India’s ISRO is developing the GSLV-III launch vehicle to be able to lift payloads of 4,500 – 5,000 kgs directly into a Geosynchronous Transfer Orbit (GTO). The Indian national space agency intends to study the ascent phase of the rocket as well as the recovery of a human capsule, after it lands in the sea with a test flight during Christmas week. Such a lift capacity would allow larger communication satellites to be put into orbit or – for example – a Mars lander to be lifted or even a human-capable capsule. It would also then be able to enter the commercial satellite launch market. Later this week the Indian satellite GSAT-16 is to lift on an Ariane-5 rocket on December 5th, 2014 at 02:08 hrs (IST) from French Guiana. ISRO: GSLV-Mk III is designed to be a three stage vehicle, with 42.4 m tall with a lift off weight of 630 tonnes. First stage comprises two identical S200 Large Solid Booster (LSB) with 200 tonne solid propellant, that are strapped on to the second stage, the L110 re-startable liquid stage. The third stage is the C25 LOX/LH2 cryo stage. The large payload fairing measures 5 m in diameter and can accommodate a payload volume of 100 cu m. Realisation of GSLV Mk-III will help ISRO to put heavier satellites into orbit. India is also continuing with the development of a 2-man space capsule though any manned space flight is not yet budgeted for and could – at the earliest – take place during the national 5-year plan for 2017-2022. 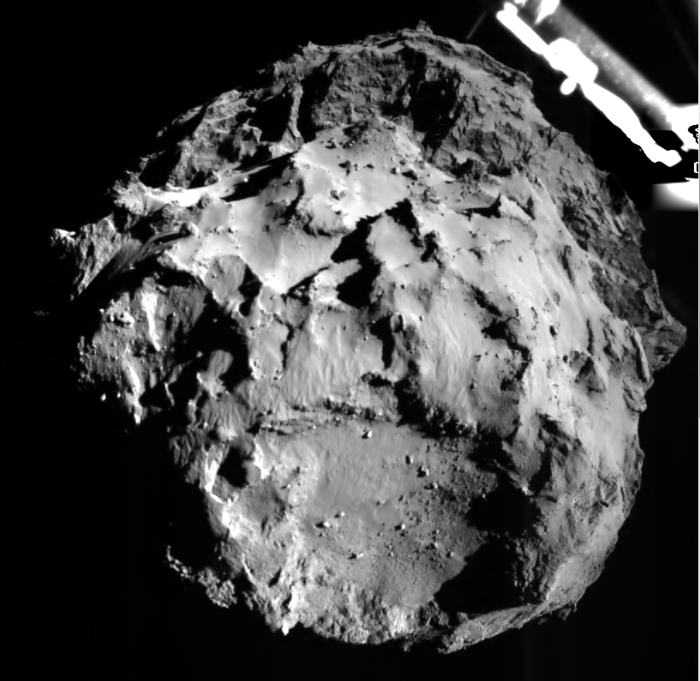 Philae successfully separated from Rosetta and arrived at Comet 67P/Churyumov-Gerasimenko. It did land but its anchoring harpoons apparently failed to fire. Magnetic field data indicates that Philae has touched down at least 3 times. 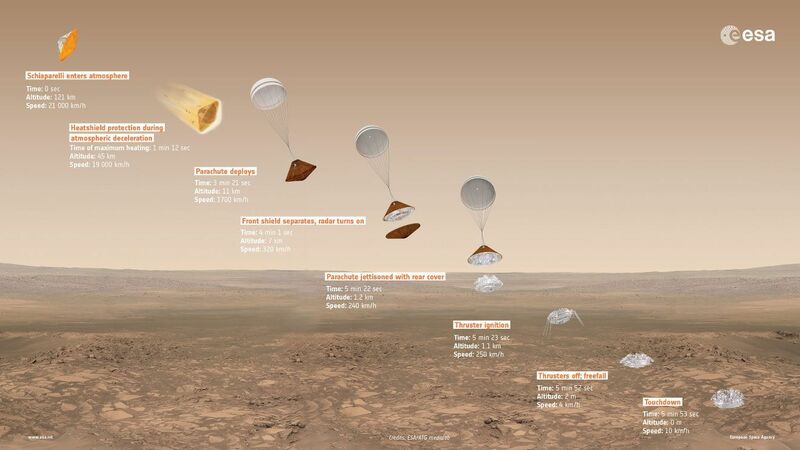 After the first, the lander bounced and took over 2 hours to touch down again. It bounced again and then touched down 7 minutes later. It is hoped that it has come to rest with the 3rd touchdown but this will not be confirmed till this morning. (Update! It has just been confirmed that the lander is on the surface, stable and sending pictures. Its attitude is not known but full data transmission seems to have been established. Data on the tomography of the comet’s nucleus is also being transmitted). A remarkable achievement after a 10 year journey. Now the Rosetta orbiter will remain in close proximity to the comet and will accompany it as it approaches the Sun. The Rosetta mission is due to end in December 2015. “By then, both the spacecraft and the comet will have circled the Sun and be on their way out of the inner Solar System”. The ROLIS instrument is a down-looking imager that acquires images during the descent and doubles as a multispectral close-up camera after the landing. The aim of the ROLIS experiment is to study the texture and microstructure of the comet’s surface. ROLIS (ROsetta Lander Imaging System) is a descent and close-up camera on the Philae Lander. It has been developed by the DLR Institute of Planetary Research, Berlin. The lander separated from the orbiter at 09:03 GMT (10:03 CET) and touched down on Comet 67P/Churyumov–Gerasimenko seven hours later. An unmanned Orbital Science’s, Antares, cargo rocket carrying a NASA payload to the International Space station has exploded at launch. 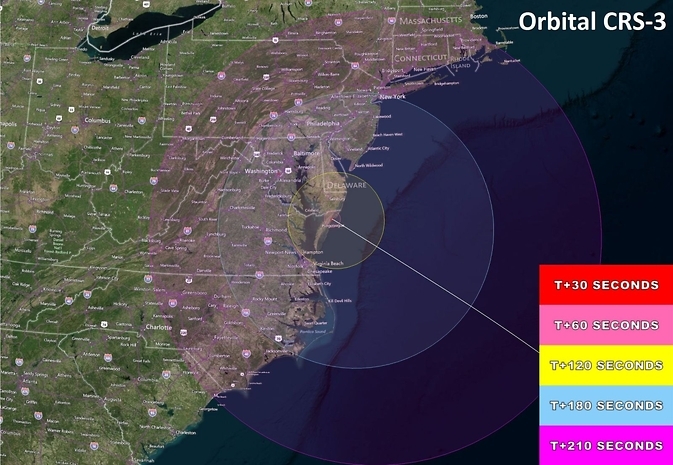 An earlier launch attempt a day earlier had been scrubbed because a boat wandered into the launch area at NASA’s Wallops Flight Facility in Virginia. Orbital also supports human space flight by supplying commercial cargo resupply services for the International Space Station using our new Antares® rocket and Cygnus™ cargo logistics spacecraft. In addition, Orbital provides full service engineering, production and technical services for NASA, DoD, commercial and academic space programs. The previous 4 launches of the Antares have been successful. The business of operating private launch vehicles is still a risky and expensive business. Orbital Science’s contract with NASA in 2008 was for NASA to provide $171 million in addition to the $150 million to be funded by Orbital. As of December 2013 costs expended had reached $530 million with $288 million coming from NASA. Orbital is quoted on the NYSE and in 2013 had revenues of $1.36 billion with a net income of $68 million (c. 5%). They report an operating margin of 8.3% so development costs are a little over 3% of revenues. A private Orbital Sciences-built cargo launch to the International Space Station ended in a fiery explosion just seconds after liftoff Tuesday night (Oct. 28). Orbital’s unmanned Antares rocket exploded in a brilliant fireball shortly after launching from NASA’s Wallops Flight Facility in Virginia at 6:22 p.m. EDT (2222 GMT), crashing back down to the launch pad in a flaming heap. The Antares was carrying Orbital’s unmanned Cygnus spacecraft, which was toting 5,000 pounds (2,268 kilograms) of food, scientific experiments and other supplies on this flight — the third cargo mission to the space station under a $1.9 billion contract the company holds with NASA.